An interesting thought in an MA dissertation: democratic transitions can be better be understood in terms of actors’ collective action problems (read through the lens of Olson’s classic Logic of Collective Action study) than a simple balance of power and resources rooted in regime legacies. Who says marking coursework is boring? > A pre-term discussion with SSEES colleagues about timetabling and options morphs into a rather more fundamental and interesting exchange of views about how to study Eastern Europe. What, we wondered, was the proper place of options in langauges like French or Spanish on East European studies degree? Not at all or at least only a very peripheral one if one takes Eastern Europe in the traditional sense as referring to post-communist countries, which are – despite the diverging paths of East Central Europe and the FSU since the fall of communism – bound by history, culture and not dissimilar process of transition. On the other hand, we live in a world where the East/West division of the continent has melted away and is being ever more eroded by lapping waters of EU integration, which may, in fact, be shifting the fundamental dividing line further to the East to the borders with …. Ukraine? Russia? Turkey? Hard to tell. Students are interested in Portguese-Hungarian parallel in economic restructuring or Spanish-Polish experiences of democratization and regionalization – a commonplace enough comparison in academic literatures. Václav Klaus (who else?) banged the nail squared on the head when opening the new SSEES building last year, by telling the assembled audience that, linguistic kinship and historical geo-politics aside, he didn’t consider himself a Slav and certaintly not an East European. Reprising Masaryk’s discussion of the Problem of Small Nations, which partly prompted the foundation of SSEES in 1915, he didn’t quite suggest a wholesale name change – the School of Wider European Studies, perhaps ? – but the logicof his argument was clear enough. Other academic institutions have, of course, grappled with the same problem: just how Europe does Europe now divides up and just what does ‘our region’ as specialists on post-communist politics tend to call it (or should that be ‘regions’) now consist of. An ESRC research project of the 1990s posed the question directly – One Europe or Several? Despite many interesting and useful pieces of research pon diverse aspects of European politics, economics and society East and West, no very clear answer emerged. >A Czech John Prescott ? 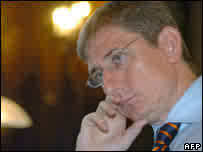 > And spare a thought too for embattled (and majority less) Czech PM Miroslav Topolánek, whose minority government seems to have little chance of winning a vote of confidence and whose wife is leaving him after his relationship with a fellow MP overstepped the bounds of being just good friends and party colleagues. 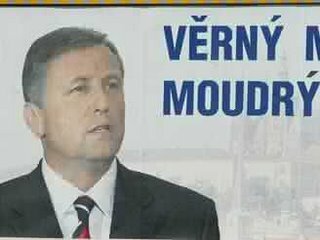 Anonymous billboards in his home region of Ostrava (see picture), where his wife is running against his party as indepedent, mock him as “A Faithful Husband and a Wise Leader”. The style of the posters echoes the negative advertising of the Social Democrats’ recent parliamentary election campaign, although they deny all knowledge and express disapproval (laughing behind their hands no doubt…). The ODS leader is undoubtedly a weak spot for his party, rapidly become the John Prescott of Czech politics due to malapropisms, gaffes and tragic-comic infidelity, and the Social Democrats (and their supporters) know it. Social Democrat leader Paroubek, no smooth operator himself, is a cut above Topolánek and Czech right commenators pay him the compliment of viscerally hating him. >Chewing over themes for an upcoming event on the Czech-Slovak elections via email, I realize just how tricky meaningful comparison of the two halves of the old Czechoslovakia is these days. Apart from a large academic sub-genre on the break-up of Czechoslovakia in 1990-2, the more standard pairing (as seen in dozens of US PhDs) is to compare Poland and the Czech Republic, but perhaps because the whole Mečiarism episode and the Hungarian minority dimensions produces a line up of parties making neat comparison difficult. A colleague also suggests that the now increasingly fashionable issue party patronage and the state – subject of a recent special issue of the Journal of Communist Studies and Transition Politics. Interesting but is damn hard to measure The Czech Republic and Slovakia are often paired in the literature as having high levels of state politicization and as late reformers in state transformation despite their different trajectories in 1990s with Klaus/Zeman and Meciar as the principal (pantomime?) villains of the piece. The new ODS government, which squeaked into power in the Czech Republic last month and still faces a confidence vote in October it is likely to lose, has still not wasted anytime replacing various officials and government nominees on public bodies… But I’m not sure quite what the comparative angle is here. Clientelism? Party patronage? Well, yes there’s a lot if it about, but how might it be different in the two countries? To cap it all, I find the Slovak party system hard to categorize. Even saying that it is unstable and fragmented seems too much of a generalization too far now Robert Fico and Smer have stacked up almost 30 per cent of the votes and got in the driving seat, although whether they will have the rubberish resilience of their Czech comrades at the end of four years in office.remains to be seen. The gory details of the ongoing Czech political imbroglio (to date) will shortly appear as briefing paper on the website of the European Parties Elections and Referendums Network. Karen Henderson’s excellent briefing on the Slovak elections and their shorter, sharper outcome appears is just below. > An interesting reflection on the relationship of radical Islamism and the Marxist left by Fred Halliday, who argues that there are ‘ signs of a far more developed and politically articulated accommodation in many parts of the world between Islamism as a political force and many groups of the left’ that simply the opportunistic grasping for allies characteristic of the (far) left in the 1970s and 80s. The ‘many voices of resistance’ thesis of the post-Cold War anti-globalization movement – which in its broadest interpretation can include the post-fascist European New Right (Nouvelle droite) of Alain de Benoist and friends – and the shibboleth of Neo-Liberalism have added to this pattern. Indeed, as headbanging defences of the fag end of the nomenklatura (Miloševič, Lukasenka et al) and/or its ‘achievements’ under socialism by writers like Neil Clark (part of the bizarre intellectual diaspora spawned by the Revolutionary Communist Party sect of 1980s, naturally) show, this is a club anyone can join. Indeed, even the Chinese – surely beneficiary of globalization, although I guess with some claim to have pioneered a Third Way of sorts – seem to be getting in on the act, cosying up to Hugo Chavez and Iran, although energy supplies, rather than anti-imperialism seems the motive force here. The declining Western socialist left, says Halliday, has misunderstood that radical Islam has simply gutted and recycling the basics of anti-imperialist thesis, rhetoric and organization forms of old style mass Communist parties for other ends. While ‘Islamo-fascism’ is probably a misnomer for anything but the crudest polemics, other authors have noted the intellectual roots of radical Islam also stretch back to the anti-Enlightenment thinking of the German interwar ‘Conservative Revolution’ , sketching out a Sonderweg, which saw Germany as a distinct culture from the West. The bizarre logic of all this seems to be that if you don’t find this Hells Kitchen of radical forces remotely appealing you are corralled, rather like the Cold War liberals in an earlier ages, into a Defence of the West camp with US neo-cons as it (admittedly now rather battered) Praetorian guard. If, to paraphrase the placards seen at demonstrations against Israeli attacks on Lebanon, we are not ‘all Hezbollah’ then it seems we are all bourgeois liberals, working out how best to Westernize the rest of the world and which bits can’t (or don’t need to be) Westernized. Karl Marx, one feels, who saw even small Central European nations such as the Czechs as so much ahistorical detritus, who should be swept away by the juggernaut of (German-speaking) modernity, would be with George Bush on this one.